Brent Liddle, a wilderness guide from Haines Junction, Yukon has spent over three decades exploring one of the most remote corners of North America. Between 1975 and 2002 he served as an interpretive guide at Kluane National Park: a 22,000 square kilometer wilderness area in the Yukon straddling the southernmost limit of the Arctic. Kluane and adjacent parks in neighbouring British Columbia and Alaska together form the largest protected area on the planet — a UNESCO World Heritage site. The area boasts some of the highest mountains in the world as well as the largest non-polar icecap on the planet. When Kluane was created, Liddle was hired to help develop and explore the park, which, to all but a few native inhabitants was a veritable terra incognita. He’s since made countless expeditions into the park’s interior and has amassed an incredible wealth of knowledge about the region. Just going on a day hike with Liddle is like getting a crash-course in every discipline of natural science mixed with a fascinating dose of history of personal anecdote. 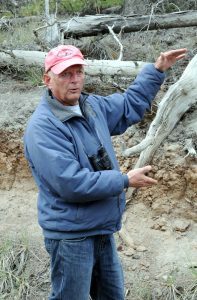 I spoke with Liddle during a recent visit to the area. He talked to me about the park and the time he spent working there. Q: When Kluane was created in 1975 you decided to take a job with the park for a three month trial period. Decades later you’re still here. What was it that compelled you to stay? 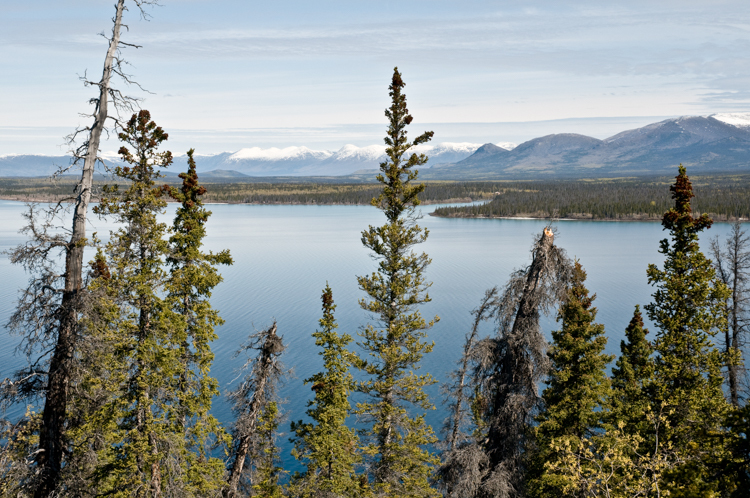 The big factor was the sense of remoteness in the Yukon at that time. There were only about 150 people living here. It was a much smaller place back then with a gravel road connecting it to Whitehorse. And the park was an unknown – that was the biggest thing. Kluane was larger than all of the Rocky Mountain parks combined. We knew very little about it. There was also the freedom that you got with moving around the park and doing extensive fieldwork. We would sometimes be gone in the field for 2 or 3 weeks at a time. That’s a luxury that we don’t currently have. We’d go into remote backcountry areas – by helicopter – and get dropped off to explore a particular area. We’d later write up reports on it and describe what we felt was unique by way of plant life, animal life or geological features. That information slowly accumulated and took shape to paint a picture of the park. Once we did the biophysical inventory over a 10-year period, we had enough information to start developing visitor centres, displays, and publications. That was my job and it was pretty sweet. The parks at Banff and Jasper were fait accompli. By taking a job at either of those places, you were basically walking into an existing program. Kluane, on the other hand, was a wide-open book and was much more challenging. Canada is known for its wilderness areas and parks. What makes this one so special? It’s special for three reasons. First, it has the highest mountains in Canada. Many people are familiar with the Rockies but very few Canadians (and even fewer outside Canada) have ever heard of the St. Elias Mountains. That range is an extension the north coast mountain range and it’s one of the highest coastal ranges in the world. The crowning glory is Mount Logan, the highest mountain in Canada at 5,959 metres. You can throw in loads of superlatives and figures if you want to impress people. Logan is one out of fifteen peaks that is well above 5,000 metres. Some of those peaks remained unclimbed until the 1940s. Even today there are still many unclimbed peaks and unexplored valleys. And even after being here nearly 40 years I still feel like I’m scratching the surface of what has yet to be discovered. 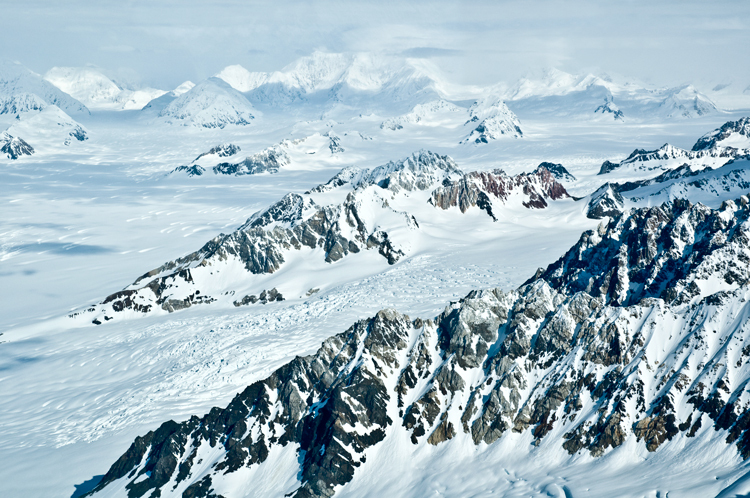 Second, those mountains are mantled by one of the largest non-polar icefields in the world. That huge icefield is perpetually fed by storms from the Gulf of Alaska, and radiates down into the lower valleys in the form of valley glaciers. Many of these are still advancing and some are surging dramatically, creating glacial lakes. Because of that they’re very highly respected by native people who consider glaciers to be living beings. If you don’t behave properly around them they can swallow you up, drown you, or do what they wish with you. The other main feature is the plant life and wildlife because we’re at the dividing line between the Pacific and the Arctic. We’re at the northernmost limit of Pacific plant and animal species, and the southern limit of Arctic plant and animal species. So you have this interesting overlap. We have humming birds, orchids and lilies growing in the southern part of the park, and to the north it’s Arctic cotton and Singing voles and other Arctic species. Both are within a couple of hours drive. 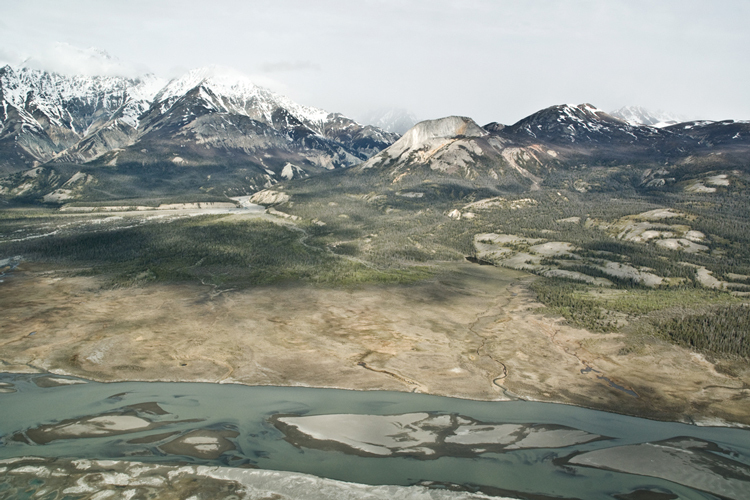 You’ve described the Kluane area as Canada’s last unexplored region. What made it so? A number of factors. Remember Alaska was essentially Russian America until 1867. Much of this area was out of bounds for a long time. More importantly, the region was the traditional homeland of the Tlingit people who are similar to the Haida. They were a very powerful, warlike people who controlled trade with the interior. They maintained a trade monopoly on all trails from the coast to the interior and kept the Russians out. Because of that presence of Tlingit people, because of Russian America, and because the Hudson’s Bay Company was actively forced out to the point of their fort being burned to the ground by the Tlingit from what is now Haines Alaska, the Hudson’s Bay Company never became established in southern Yukon. They got as far south as Fort Selkirk on the Yukon River, and at Francis Lake, but they never ventured further south into Tlingit territory. That’s the reason why it remained unexplored. The International Boundary Commission initially mapped these big mountains when it finally settled on the border between Canada and the US in 1913. 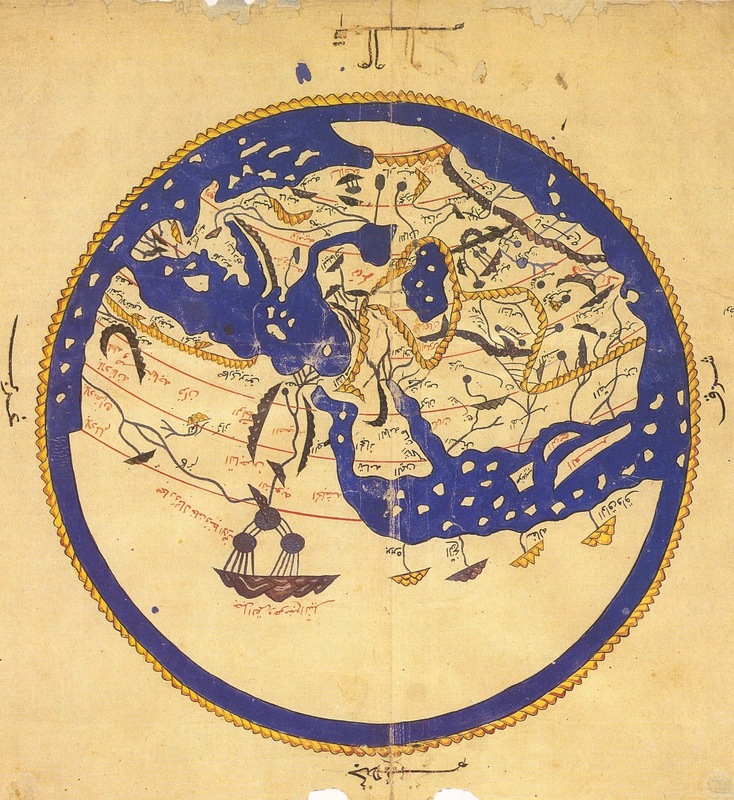 That gave mapmakers reference points to more thoroughly explore the interior mountains. But that didn’t happen until the late 1930s or 1940s when institutions like the American Geographical Society and the National Geographical Society came in. 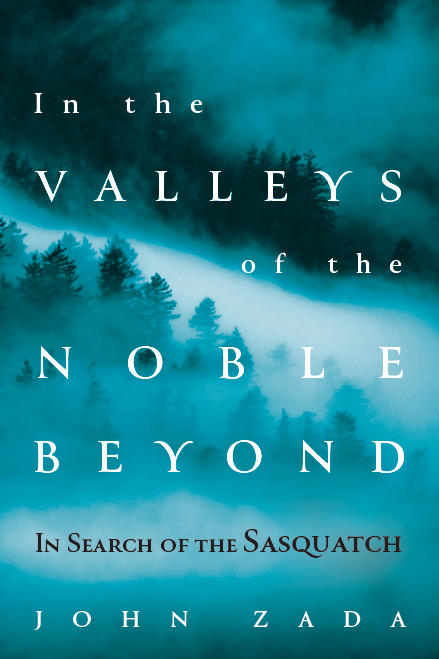 They were both instrumental in mapping the interior. You’ve been tied to the park for more than three decades. What have been the most notable moments of discovery for you? Let me first say that a lot of it was just happenstance – being at the right place at the right time. Quite often that’s how most discoveries happen. A good example of that was when we used to do spring field trips to identify animals and plants in what is known as the Hoodoo Mountain area of the park. I kept on returning to that high alpine area which is quite remote. It’s an all-volcanic region. I found out later that it was a volcanic caldera that had completely collapsed. The rock formations are really interesting. I found some little chips of glass that I didn’t think much of at the time. So I collected a few and put them in my office drawer. And then an archeologist wandered by several years later and said, “Have you ever heard of any obsidian in the park?” And I said, “Obsidian? What’s that?” He told me it was volcanic glass that occurs very rarely. I said, “Oh, you mean like this,” and I pulled open my drawer and he just about fell off his chair. These were tools that were 5,000 to 8,000 years old that I just picked up off a mountaintop. So we went back to that area for several more years. By chance we followed one lead to the next and eventually found our way to the source area where there was an obsidian quarry. It was one of the largest obsidian quarries in the entire Yukon. There’s another one at Mount Edziza in northern British Columbia and a few more in Alaska. But this was certainly one of the biggest source areas that we’d come across. It’s pretty exciting to look at artifacts that somebody had left behind, thousands of years ago, sitting right out on the surface. We were wandering around in that same area one day and had made a short cut through a pass and we walked right into a bunch tree stumps. This was at an elevation of about 6,000 feet. We were thinking, “What the heck?” We looked closely at these tree stumps and noticed that they had turned to stone. It was a petrified forest. So I started turning over some rocks and found some incredible tropical plant fossils that were millions of years old. That was another dumb-luck find. You also made a historical discovery at a place called Bullion Creek. Yes. In 1903 there were 1,400 miners working in this area, which is a huge number. That’s about double the present-day population of Kluane. Bullion City was one of the major mining communities. In its heyday it was probably home to about several hundred people. I came across a cabin in that area in 1975 that still had place settings on a long table that sat 20 people. The plates, the silver and the cutlery were still laid-out. The interesting thing is that the plates weren’t the cheap tin ones that you’d expect from miners in those days. They were Limoges plates from France that were high-end china for that era. To think that they were hauled in here by horse and wagon in 1903 is pretty amazing. What have your experiences in the park taught you about exploration and discovery? I guess I could steal a few phrases from The North Face: never stop exploring, never stop learning. Around every corner there’s something new to discover. Even after being here all these years I still feel like a newcomer looking for new opportunities and things to discover. To me it all boils down to observation and curiosity. It’s something which we all do very well as children. But it’s also something which most of us lose when we’re adults. What things might be hidden in the park awaiting discovery? There’s so much. I’m waiting for the ice to continue melting. Ice patches outside of the park are yielding the organic remnants of natives that were hunting caribou that are 10,000-15,000 years old. Similar finds are awaiting discovery within the park as the ice patches there melt. There are many ancient artifacts and campsites that have yet to be found. National Geographic sponsored an expedition here in 1936. They flew in from the coast, crash-landed on a glacier and unpacked all of their stuff. The plane then left, never to return. The two explorers who were dropped off had to pack over two of the highest peaks in North America in order to get out. This was before the Alaska Highway was built, and it took them weeks to do. They had to go up and over Mount Lucania, which is over 5,000 metres, then down and back up and over Mount Steele, which is also at that elevation. They had no supplies with them – they left them all on the glacier. The interesting thing is they had large format cameras and all these other goods and supplies that were left behind because they couldn’t pack it out. When we had a mountaineering reunion here in 1985, the gentleman who left all of this stuff behind, Bradford Washburn, who was an amazing mapmaker and mountaineer, put an exact ‘X’ on the map where they’d crash-landed. Sometime in the future that material is going to move down the glacier and melt out of the toe. That’s one of many stories. There are expeditions that left the area of Russell Fjord and instead of going the land route they went towards the Klondike Gold Rush over the icefields. Out of around two hundred people who left Russell Fjord, 20 people made it to Dalton Post 18 months later. So those remnants of whatever they left behind – and their mortal remains – are going to come melting out of the ice sooner or later. What are some of the least explored areas of the park? There are many routes in the so-called “front country”. Remember that two thirds of the park is an ice cap. Nobody is wandering around there. So that leaves one-third that’s greenbelt. That area is comprised of relatively small peaks – 3,000 to 4,000 metres – and incredible valleys. There are established trails of maybe 100 kilometers, but you can lose yourself for weeks in the park and not see another soul. North of the Slims River Valley there is the Duke and Donjek River valleys which are immense. They offer tremendous opportunities for people to explore on their own and challenge themselves because there are no designated travel areas. Once you’re in the alpine you just go. How far you go is up to your own interest and physical stamina. You can go for a few days, a few weeks, or for the whole damn summer. It’s just limitless. We’re talking about a park area that’s 22,000 square kilometers. That’s a lot of country. And even though two thirds of it is covered in ice, that still leaves a lot of unexplored areas. What sort of things are you doing at present? Since retiring from Parks Canada in 2002, I’ve continued to guide. I can’t get that out of my blood. I still love to take people into the park and share my knowledge of the area. And I’m still keeping an eye open for new discoveries. It’s amazing what you find when you look. Every time I go into the park, it’s never the same trip. Beyond that I’ve also been volunteering to help establish national parks in developing countries. On a whim I threw my name into a hat to see what other countries might be interested in having me help them develop their parks and protected areas. And after just one email I received a few replies. One from Chomolangma, the other from Bonampak. I had to Google those places just to see where the heck they were. Well, Chomolangma is aka Mount Everest in Tibet. So, I contacted these people and they were very eager to sponsor me. I went there over a three-year period and established a small visitor centre and developed some interpretive plans for them. And Bonampak was a Mayan site in Chiapas, Mexico. And again, I did some interpretive work with the locals there. So, my experience here helped get my foot in the door to some very interesting parts of the world. And that’s still ongoing. Brent Liddle offers hikes and bed-and-breakfast style accommodations at the edge of Kluane National Park. He’s located on the Haines Road, 27 kilometres south of Haines Junction. He can be reached via his website. Click here to read about a glacier expedition I took part in near Mount Logan in the St. Elias Mountains.